Aviation mags showing military aircraft of the future not having vertical rudders. In most applications, yaw is controlled by flap(s) that either come up together or seperate that now have to be counteracted in also the pitch and roll axis at all times. So a gyro or flight controller is needed. You can use stabs, but doesn't do much for scale. 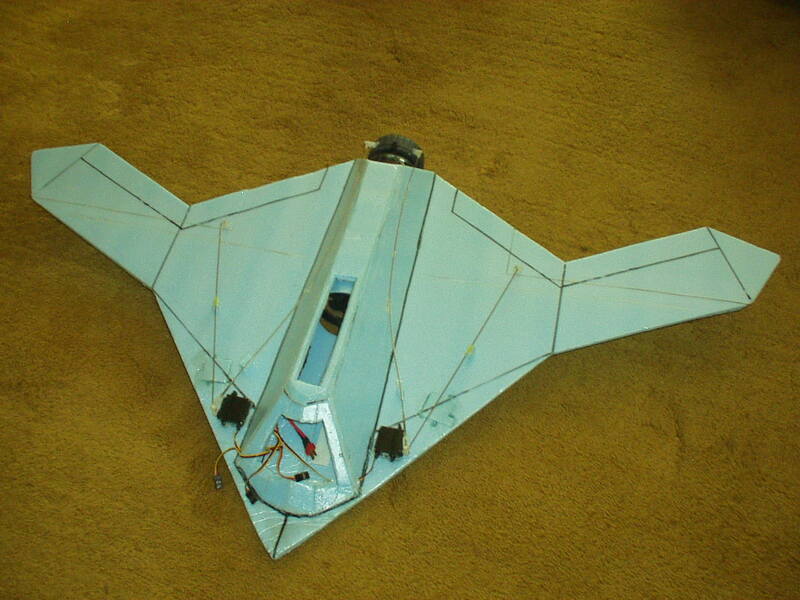 So the question is, can a RC plane be designed and be scratchbuilt to somehow eliminate the gyro or FC? Another project I was working many years ago on "thrusters", I made a stupid mistake of mounting a TV nozzle 45 degrees off axis. Noticed the strange behavior on what it did. Stupid mistake. Need to pay attention when you glue. How to get yaw? Need to use TV nozzle,Yes, how do you move it? Mind went back to mistake, bingo, I got it. So went about getting a top view of the X-47B (old school, used just paper) and built in my cheap 5 bladed 64mm EDF in a structure that just holds the EDF. Then I built "THE SLED" and set up my config using 70mmEDF. Started off with gyro for only elevons, then removed it, Now look at only the 2 servos. Plane is set up with elevons. Notice each servo is also hooked up with a wire to the nozzle. Let's do elevator up. Both servo arms move to the front. Because each wire is hooked to the TVNozzle, it pulls up both to add to the elevator motion. Now, do ailerons, what happens is one servo arm goes up and the other goes down. For right turn, the left arm goes back and at the TVN, the motion moves the nozzle to the right for yaw!!!!!!! Now the right servo moves forward to combine with the left TVN and moves it to the right. It will only work correctly when the TVN is exactly 45 degrees off the TVN grooves. Otherwise you induce side effects. Did it work? yes and no, Always had exciting flights for full open on the 70 mm 12 bladed put it going 100mph easily. Still unsuccessful. Without a rudder, the drag goes down quickly. Screwed around for about a month and finally came up why it didn't turn at all or very little. Let me put some more stability in it and start off with an angle of incidence and let's quit with the sled and go for it. Again, notice that the second pair of wires goes to the TVN so up elevator moves the nozzle up as it moves forward and right roll the result is the exhaust moves to the right. For those who use TVN, how much deflection is needed especially for rudder which is an aileron function. Too little, over you go, too much, over you go, just right, ahhh. I feel I can scratch build, but as you can see I rate 1 out of 10 for painting and doing videos. Sorry, can't be good in everthing. Notice launches should be level, Did both right and left turns to insure it capabile of doing both. This work was over 4 years ago and it was a "first" when I got the displacement of the TVN.